Road transport contributes to 20% of the EU’s total CO2 emissions, a quarter of which are due to heavy-duty vehicles including trucks and buses. To reach emission reduction targets, the share of green public transport solutions like electric buses needs to be increased. 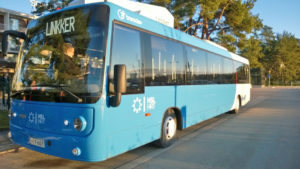 Innovation: EARTO member VTT developed with its partners a unique and complete electric bus system combining energy optimised drive lines, light aluminium construction and automatically fast charging electric buses. Batteries can be charged in 2 to 6 minutes at the termini when new passengers are boarding the bus. Batteries’ fast-charging capacity and smaller size reduce charging and maintenance costs as well as investment needs. Impact Delivered: VTT and its partners help municipalities accelerate the move towards e-buses by supplying the technology and providing support in transition planning, sharing best practices and creating a shared knowledge base with an innovation line concept and a network of partners. 12 of these e-buses worth €5 million have already been sold. In Helsinki, a total cost reduction of €300 million could be achieved if a fleet of 1300 conventional buses was changed to e-buses. VTT Technical Research Centre of Finland Ltd is the leading multi-technological Research and Technology Organisation in the Nordic countries.